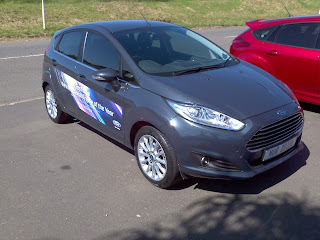 The Fiesta range has really grown up since its launch in South Africa, in 1996. The car went from basic to sophisticated to technology leader, so it's seen it all. Speaking of technology leaders, the biggest yet is their latest instalment of the Fiesta, i.e. the 1.0 litre EcoBoost. Thanks to Ray from Kempster Auto Umhlanga for setting us up with the 1.0 litre EcoBoost Titanium. The old version of the Fiesta was sporty enough, but this new version looks amazing, even though it is just a face lift. I guess what does it for me is the new front grille, which very closely resembles that of an Aston Martin DB9, and the reconfigured rear light cluster with the large high boot spoiler. Inside the cabin, it looks like not very much has changed. The console looks the same with buttons for full function cell phone control, but it's finished with better materials and looks funky and classy at the same time. The instrument cluster, as well, has a better more refined look to it, although it has the same general design. The steering feels compact and sporty, makes you not want to take your hands of it! Cabin space is managed properly and there's a lot of storage spaces around, which the previous model lacked. Before the actual test drive I did some research on the engine in this car. The Fiesta runs a 1.0 litre three cylinder engine, which was voted International Engine of the Year 2012! It's not the first time that a three cylinder engine has featured in a car, we saw it back in the day with the Daewoo Matiz, and recently Toyota fitted one to their Yaris and Aygo. These cars were created as budget cars and gave you great fuel economy but not such a thrilling driving experience. Fords 1.0 litre engine falls into their EcoBoost category. This means that it's turbo charged, and is able to take this 1.0 litre engine to a mind boggling 92kws of power output and 170nm of torque, which is able to achieve a fuel economy of 4.3l/100kms. Out on the road, I was expecting that the car will perform above average, because of the turbo, but the acceleration that the 1.0 litre pushed out was not what I had anticipated. Ford compares it's power to most normally aspirated 1.6 litre engines, but what I experienced was definitely not a 1.6. You could feel the boost from the word go, acceleration was quick, and gear changes were sharp and smooth. Adding to the excitement was the off beat grunt that the engine made when revving up. The EcoBoost comes with a 5 speed gearbox, in a market were everybody is going six speed I found it strange that Ford didn't feel the need to include a sixth gear, it would have definitely helped with long distance travelling. Freeway driving was a breeze, the 1.0 litre showed no signs of strain at all, and overtaking was confidently done. Even at high speeds the engine responded well to the slightest push of the accelerator. The bends around Sibaya was not a challenge at all to the compact little hatchback, and I was reluctant to return to the dealership as the test drive came to an end. The car is not what you'd expect it to be and I strongly suggest test driving this car, so as to not underestimate its capabilities. 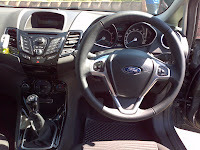 The Fiesta EcoBoost is guaranteed to be fun at a very minimalistic fuel cost, and Ford will even put you in the Titainium version from as little as R231 500 (April 2013). You'll get a 4yr/60000km service plan and a 4yr/100000km warranty. There's no need to panic once you are out of service plan as the service intervals are every 20000kms, which will assist in allowing you to budget for your next service.